To avoid unwanted delays and, even worse, incidents on the road, it's really important to give your car some love this summer, before you head off for your next adventure. Give it a good once over. Check your tyre pressure, as this can reduce the control you have over your car, as well as the life of the tyre by around 10% reduction, plus it can contribute to an increase in fuel cost, which nobody wants. Fill up your water for your window washers so that any dirt picked up from motorway or country driving is easy to shift, particularly with the sun (hopefully) dazzling through the windscreen, showing up all kinds of things that can obscure your view. Make sure your oil levels are as they should be and ensure you have a) a spare tyre, in case you unexpectedly pick up a flat, b) or a tyre repair kit for any small areas of damage, and certainly c) the details of your road side rescue company. I dare say that being stuck by the side of the road with a hungry, tired and hot family is very much fun at the best of times, let alone in summer! 1. Did you know that the that the primary function of tread on a tyre is to divert water from beneath the tire to improve traction with the road? Me neither! Look at the tread pattern on your tyres and you might see see the beginnings of bars start to form between the treads, or running across the tyres. As they wear, these bars become flush with the tyre's tread. At this point, you know it's time to replace them. Take a 20 pence piece and place it at the centre of the tread, where it's at it's thickest. The tread should be as deep as the edge on your 20 pence piece. If your tread varies across the width of the tyre, it could indicate a wheel misalignment, the need for a tyre rotation, or perhaps even both. If this is the case, your car may need a service. 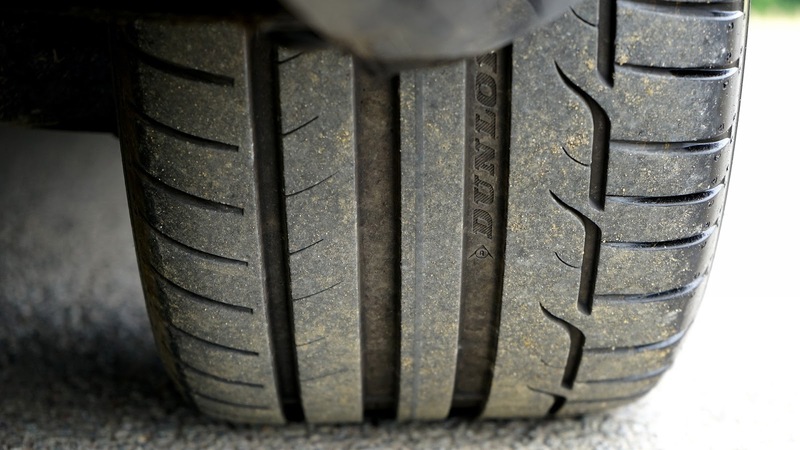 Uneven tread wear is a sign that you need to take your car in for servicing. 4. Good vibrations? Not in your steering wheel! If your tyres have been worn unevenly, you may start to feel a slight vibration in the steering wheel when you are driving. This may mean that your tyres need to be rebalanced. If that doesn't stop the vibration, then it is more than likely the tyre is damaged and needs replacing. There's obviously a lot to consider when taking care of a car, but the tyres are a pretty good place to start. You can find new tyres at affordable prices at Jet Wheel Tyre, across the brands, and doing those checks now could make all the difference this summer when it comes to keeping your holiday plans and days out with the kids on track.